Fiber is classified as either soluble or insoluble. When regularly eaten as part of a diet low in saturated fat and cholesterol, soluble fiber has been shown to help lower blood cholesterol and may also help reduce the risk of diabetes and colon and rectal cancer. The American Heart Association recommends that you eat at least 25–30 grams of dietary fiber — in both soluble and insoluble forms — every day. 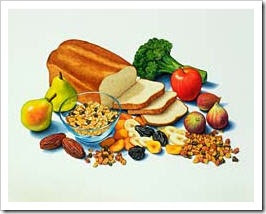 The more calories you require to meet your daily needs, the more dietary fiber you need. Try to eat at least 14 grams of fiber per 1,000 calories you consume. Foods high in soluble fiber include oat bran, oatmeal, beans, peas, rice bran, barley, citrus fruits, strawberries and apple pulp. Foods high in insoluble fiber include whole-wheat breads, wheat cereals, wheat bran, cabbage, beets, carrots, Brussels sprouts, turnips, cauliflower and apple skin. Replace low-fiber foods (white bread, white rice, candy and chips) with fiber-containing foods (whole-grain bread, brown rice, fruits and vegetables). Try to eat more raw vegetables and fresh fruit, including the skins when appropriate. Cooking vegetables can reduce their fiber content, and skins are a good source of fiber. Eat high-fiber foods at every meal. Bran cereal for breakfast is a good start, but try to include some fruits, vegetables, whole-grains and beans in your diet, too. Be sure to increase your fiber intake gradually, giving your body time to adjust, and drink at least six to eight 8-oz. glasses of fluids a day. Read the Nutrition Facts label on all packaged foods that claim to contain oat bran or wheat bran. Many of these products actually contain very little fiber and may also be high in sodium, calories and saturated or trans fat.